Dwyane Wade was never “hit in the face” by LeBron during the Miami Heat’s NBA Finals appearance against the San Antonio Spurs earlier this month, as that’s a scam. “[VIDEO LEAKED] – Wade gets hit in the face by Lebron after game 4 finals,” the whole thing reads, and it has a photo of the two players with a play button over it. Scammers make money by spreading hoaxes via Facebook and the offer surveys. 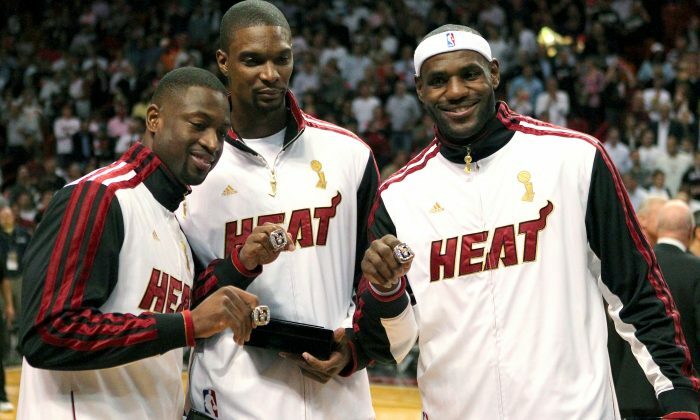 MIAMI (AP) — The Miami Heat got the guard they wanted, and made LeBron James thrilled in the process. The Heat acquired the draft rights to Connecticut guard Shabazz Napier in a trade with the Charlotte Hornets on Thursday night, giving up the 26th and 55th picks to make the deal happen, along with a future second-round choice and cash considerations. “My favorite player in the draft!” James tweeted in reference to Napier. And that’s a very good sign for Miami’s future. “It’s a perfect moment for my family,” Napier said. Napier was taken at No. 24 by Charlotte, two slots before Miami drafted former North Carolina guard P.J. Hairston for the Hornets. Miami took former Xavier guard Semaj Christon in the second round, also sending his rights to the Hornets. Napier wasn’t a lottery pick, but wound up on a team that clearly both wanted him and wanted to make James happy. Napier averaged 13.7 points in his four seasons at Connecticut, going 12-1 in NCAA tournament games and winning two titles in his time with the Huskies. He averaged 18 points per game as a senior, and improved his outside shot in each of his final three college seasons. And the Heat have done fairly well with UConn guards in the past: Ray Allen has been in Miami for the last two seasons. The draft is just the first step of what’s going to be a busy couple of weeks for the Heat. Free agency’s epicenter this summer may as well be Miami, with James already a free agent, Dwyane Wade and Chris Bosh deciding if they will opt out as well, and several other players from this year’s team also looking for new contracts either in Miami or otherwise. Wade and Bosh have not revealed if they will forgo their final two years on their existing Miami deals. Another free agent from Miami is starting point guard Mario Chalmers, which might be one of many reasons why the Heat liked Napier. Forward Chris Andersen, who has a $1.4 million option for next season, said Thursday night that he will wait until free agency begins to make any decisions. It has been long expected that he would not opt-in and instead seek a more lucrative deal. On July 1, Napier is expected to working out with the Heat summer league team. And he can’t wait.